Hello! A bit of a different post for you all today as I really want to write about ‘blogging’ a little bit more. Now, don’t get me wrong, I’m very far from an aficionado on the topic (if I was I wouldn’t have a rubbish retail job and would be doing it full time!) but I thought it would be nice to share things I wish people had told me when I started out. Tip one: Limit the amount of labels you use | Have you ever been on a blog and saw a load of labels with a (1) written next to them? And by ‘a load’ I mean a list as long as your arm? Would you ever bother to click on each individual one? I sure as hell wouldn’t. Unless I’m looking for something very specific, I’d rather click on the (30) next to ‘beauty’ rather than the (1) next to some really obscure product that may have been mentioned once and never again. Limiting your labels will help readers find topics quicker and may lead to them reading more of your posts. I always use beauty, today (for my outfits), fashion, wishlist and giveaway (if I have one going). I do sometimes break beauty down into skincare, haircare and bodycare as I may expand on my ‘categories’ in my sidebar in the future, but realistically using more than a few labels throughout your entire blog is a bit of a waste. Plus, it’ll make it a thousand times harder if you do ever want to have each category as a link, as you’ll have to go through and label every single post. I’m glad I got into the habit early on, as it’s saved me so much time! So, think about what topics you’re going to cover and create a blanket name for each. 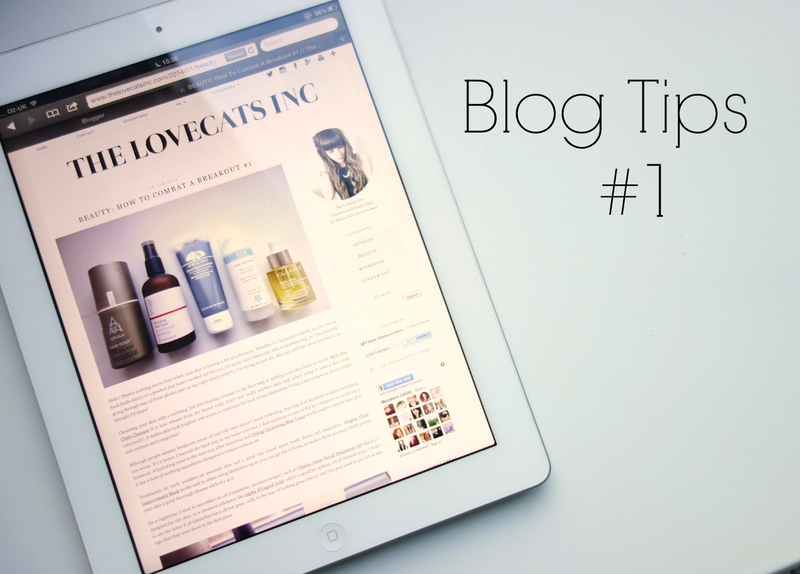 You can always add one or two extra names (such as beauty > skincare) to a post, but don’t overcomplicate things! Tip two: Optimise your time | This may be one for those of you who work, especially now when the days are so dull, and need to get the most from your spare time. If you have an evening free, when it’s too dark to take photos, write a plan of what posts you want to feature. I always do this in work as it’s a bit quieter now Christmas is over with! I jot down what beauty posts I want to cover, what products I need to include and how many outfit photos (and which items) I need to photograph. Doing this really helps structure your available time and makes the process much quicker. When it comes to your morning off, or whenever you’re free, get your photos done in bulk. If you’re just photographing products for a post, get two or three posts worth done in one go. If one of them needs swatches, do your makeup or paint your nails that morning so you can get it all done at once. As for outfit photos, I know those who take photos outside are a bit different, but if you’re just a wall and a tripod gal like me you can also do those in bulk if need be. Sometimes I’ll take two or three lots of outfit photos in one sitting, just changing my lipstick or nail colour inbetween to make it look fresher. I’m still representing what I’d wear, as I tend to photograph outfits I want to wear that week so I’m not compromising on my personal style. This really helps when you’ve only got a morning off or one day a week to focus on your blog! As for writing your posts, if you’ve got a spare half an hour on an evening when you’d just be watching tv, grab your laptop and write up a post! Then, if you’re too busy for the rest of the week, you know you’ve got a post pre-written and ready to publish so you’ll be less worried. Tip three: Schedule everything | Also another one for workers, scheduling makes such a difference to your blog. If you know you’re at work or busy for the full day, make sure you write your post the day before (or whenever you have time) and schedule it for the day you want to post it. The time depends entirely on you, but it’s good to check Google Analytics to see when people are on your blog so you can post at the optimum time. Doing this means you don’t have to worry about having to get back from work and stressing over getting a post published, as it’ll already be done for you! Just remember to click ‘publish’ and not ‘save’. Then, if you’re on Blogger, you can click ‘Permalink’ in the blog post editor section, grab the URL and schedule your tweets using something like Hootsuite for the day it’s published. I find I get a lot more traffic from evenly spacing out my tweets throughout the day, as well as sharing my social media/bloglovin etc links, as it reaches more of my Twitter followers. Obviously you can still tweet whatever you fancy during the day (complaining about public transport is my favourite!) but you’ll know that sharing your latest blog post is covered and you don’t need to worry about promoting it. So, that’s three little tips I wanted to share with you all. I know they’re probably pretty basic, but we all have to start somewhere so hopefully it’ll help some newcomers to the blogging community. I might make this into a little series, so if you’re interested in that please do let me know!